No, this post has nothing to do with China or my recent excursions there. Yes, I do plan on posting the happenings of our final day (and trust me, it was eventful). 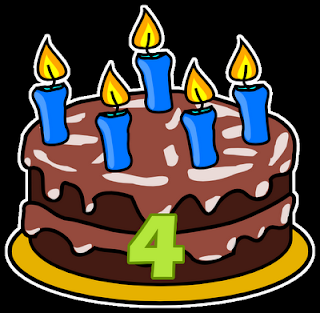 There is something else that needs to be mentioned first, and that would be the fourth birthday of this very blog! That's right, it has been four full years since my extremely lame first post on "Randomness," which was really supposed to just be a temporary name for the blog... I still haven't come up with anything better. Now, tradition states that I must bake a digital cake for dear old "Bloggy," and so I did, but not without some hangups. You see, I don't have Photoshop on my laptop. Ordinarily, this wouldn't be a problem, but the family computer at home has been having its own issues. To make a long story short, the OS was just reinstalled onto a newly wiped hard drive. So the really old version of Photoshop we had at home is no more. So this evening, I quickly downloaded GIMP, installed it, and figured out enough about how to use it to cook up this yummy cake. All in about an hour. Pretty good, if you ask me! Last year, I'd been lamenting having not written much. But this year, between a half-victorious BEDA and my trip to China, I've been blogging a lot. So leave some comments in celebration, and here's hoping that (within reason, of course) it continues! I will be writing about our final day in China shortly, but to pass the time you can read my posts on past birthdays: 3, 2, and 1. Yay for four years! I need to check out and see when my blog's birthday is!